We’ve been plagued by squirrels in our garden recently which brings two problems – not only does it scare the birds away but the squirrels eat all the feed meaning you have to constantly refill your feeder. So I decided it was time to bite the bullet and get a squirrel proof bird feeder. After doing some research it became clear the Brome 1024 Squirrel Buster Plus wild bird feeder is one of the most popular feeders available today. If you check it out on Amazon you can see it has hundreds of positive reviews so it is obviously doing something right to make people happy. Once I bought mine and got it in place, it quickly became clear that what it’s doing right is keeping the squirrels away from the bird feed! In fact I’m so pleased with it I thought I’d share my research findings with you. The Brome 1024 Squirrel Buster Plus wild bird feeder uses an ingenious mechanism to keep your bird seed safe from those pesky squirrels. The bottom section of the feeder, which Brome call the shroud, has holes in it that align with the seed ports (the holes in the main feeder). When the holes are aligned, the birds can get at the seed. Once a squirrel climbs onto the feeder though, it’s weight forces the shroud down so that the holes no longer align. In this way the squirrels (and large birds too) can’t access the seed. The weight required to close the shroud and prevent access to the seed is easily adjustable. The feeder is of extremely high quality and well constructed. It’s made of rugged UV-filtered ABS and Polycarbonate resins and powder-coated aluminum components. All the hangers, springs and fasteners are stainless steel. So basically, squirrels aren’t going to destroy it which is the problem with some supposedly squirrel proof feeders. This is one of the biggest feeders in terms of storage capacity, holding up to 3 quarts of seed. This means you have to refill it less often than other feeders, making your life easier. One of the other big pluses of this feeder is it’s unique ventilation system. One of the issues with clear bird feeders is that they basically act like a greenhouse and trap the sun’s warmth, creating ideal conditions for moist air to make the seed become damp and decay. The Brome 1024 has a patented ventilation system which allows the warm air to rise and escape from the top, being replaced with cooler air at the bottom. In this way the seed stays fresh for longer. The Brome 1024 Squirrel Buster Plus is very easy to look after, being completely dishwasher-safe. It also has a detachable component system meaning it comes apart very easily making it simple to refill. And as mentioned above, it has a very robust construction meaning it will stand the test of time (and squirrels!). At the time of writing, there were just over 1,500 customer reviews on Amazon, the vast majority of them overwhelmingly positive with an average score of 4.7 out of 5 which is remarkable for a product with so many reviews. Just the sheer number of good reviews tells you how popular this particular model of feeder is, and it is obviously up to the task for which it was designed. In summary, the Brome 1024 Squirrel Buster Plus wild bird feeder is the best and most effective squirrel proof feeder on the market right now. It’s one of the more expensive feeders but, as always in this world, you get what you pay for. It’s superior build quality and construction means it will outlast other models making buying one of the cheaper ones a false economy as they’ll need replacing sooner. Easy to use and very effective, there are many happy real buyers of this product who would recommend it to others. Including me! 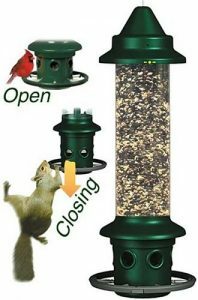 Hey Buddy!, I found this information for you: "Brome 1024 Squirrel Buster Plus Wild Bird Feeder Review 2017". Here is the website link: http://backyardbirdingblog.com/brome-1024-squirrel-buster-plus-wild-bird-feeder-review-2016/. Thank you.